With strap like foliage and an easy care growth habit, Chlorophytum comosum, commonly called the Spider plant is widely used as an indoor plant however is much more versatile. You will have seen this tough little plant growing in hanging baskets, as well as being put forward as one of the best ‘clean air’ plants, it can be even better when used in the garden as an ornamental grass. 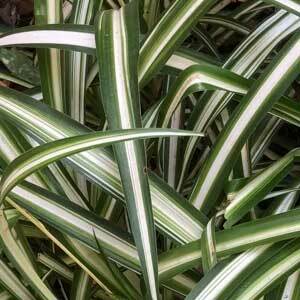 For a bright easy care foliage plant in a shaded areas Chlorophytum comosum is well worth considering. 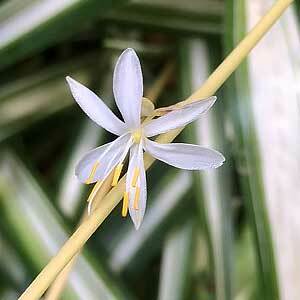 It has attractive green and white striped foliage as well a small white flowers that appear in summer. Its fast growing in good conditions, it will grow in shade and is very easy care. Although it comes from sub tropical areas, it does well grow in cooler climates if protected from frosts. It will send out long stems that will form pups where they touch the ground, so it does spread. However in urban conditions, as an evergreen grass along a pathway, next to a building or driveway it is a good choice. Indoors, grow it any position that gets reasonable filtered light. In a hanging basket it will hang down, however it is equally at home in a container. Use a normal potting mix, just ensure that the drainage is good. A frost free position is important, as is protection from cold winds. Watering with rainwater rather than tap water is sometimes recommended as heavily chlorinated water can cause leaf burn, we have not had issues with that, however different water supplies can cause issues. Very easy by division of clumps. Position – Filtered light to shade. Foliage – Green with creamy white variegation. Height – Dependant on climate to around 40 cms. Spread – Will form a good sized clump if allowed to spread. Drought tolerant – Tolerant of dry conditions in good shade.